Though telemedicine has existed in some form for over 30 years, it has failed to become prevalent, especially in outpatient clinics. Complex regulations, uncertainty around reimbursement, and inadequate software platforms all stood as barriers to adoption – until now. New options for a web-based telemedicine platform enable outpatient clinics to do many types of appointments over video visit. These solutions come in all shapes and sizes (and prices!). The goal of this post is to shed light on the rapidly evolving market for telemedicine platforms. First, and perhaps most obvious, a telemedicine platform must be HIPAA compliant. Protected Health Information (PHI) can range from complex clinical data to the name and address of a patient. With all the communication tools available to practices, from email to patient portal to snail mail, effectively protecting PHI is more important than ever. But what makes a telemedicine platform HIPAA compliant? First, the video stream must be encrypted. Most platforms are easily able to achieve the encryption standard set forth by HIPAA guidelines. Second, the healthcare provider must engage the vendor in a Business Associate Agreement (BAA). This is where platforms like Skype or Facetime fall short of HIPAA compliance. Overall, HIPAA-compliant video is important, but since so many platforms achieve the security standards, it has become a commodity. Disrupting workflow in a physician practice means lost efficiency and revenue. 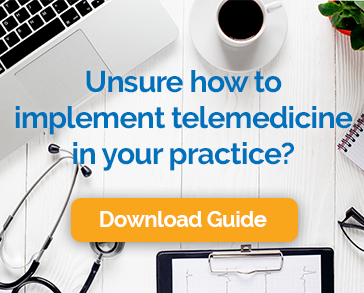 Therefore, a telemedicine platform must fit the existing practice workflow. That means plugging into EHRs and Practice Management Systems is critical. Many telemedicine platforms claim some level of integration, but few allow staff to schedule appointments exactly as they normally would, and document visits in the normal EHR. Chiron Health can integrate with virtually any EHR, so our clients’ workflow barely changes at all. Video conferencing is easier than ever. But, the truth is, many people today have difficulty connecting successfully to video encounters – regardless of their comfort level with technology. Issues with connectivity, browser or device settings, or user error can result in failed connections. The last thing a healthcare provider wants is to spend time troubleshooting a patient’s device or connection. Few telemedicine platforms provide live support for every appointment (Chiron DOES!). Here’s where the wheat is separated from the chaff: The most important service of a telemedicine platform can provide is ensuring providers are reimbursed for the appointments. However, reimbursement is not well understood. It varies from state to state, payer to payer even plan to plan. Over the last two years, Chiron Health has built a proprietary telemedicine insurance rules engine. This intelligence gives our clients confidence that they will be reimbursed for the time they spend on telemedicine visits. In many cases our clients are generating thousands of dollars in incremental revenue every month, easily achieving a health return on investment. If you’re researching telemedicine platforms and reimbursement is important to you, Chiron Health should be on your list. Contact one of our consultants to learn more today.